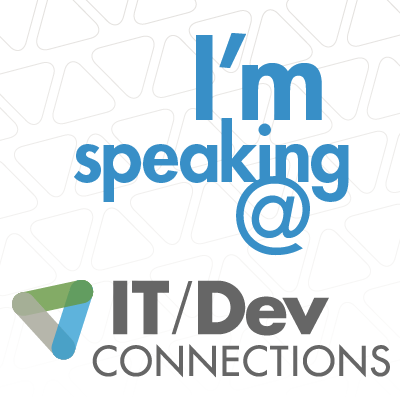 In a few weeks I will be heading to Las Vegas for IT/Dev Connections. This conference is taking place at the Aria Resort from September 15th to the 19th. With MMS being discontinued, this is an event I have been really looking forward to for the past few months. Next to being a first time attendee I am also honored to be able to deliver 2 sessions in the Windows track. The Windows track has a great line-up of speakers and sessions, and the keynote for this track will be presented by Brad Anderson, Corporate VP at Microsoft (blog). Session 1 : System Center 2012 R2 Configuration Manager and Intune: Setup and deployment Notes from the field, with a focus on Single Sign on. This session dives into what you’ll do at the server level to drive System Center 2012 R2 Configuration Manager and Windows Intune integration for mobile device management. The session includes real-life experience from the field to set up a subscription, connectors, certificates, Active Directory Federation Services (AD FS 2.0/2.1/3.0), DirSync, and workplace join scenarios among all possible server configurations that enable mobile device management. Session 2 : Managing your hybrid Mobile cloud workforce demystified with System Center Configuration Manager 2012 R2. Do you need to manage Windows 8.1/RT, including non-Microsoft mobile devices, with Microsoft’s UDM solution (Configuration Manager 2012 R2 plus Intune)? Do you need to provide functionality for deploying the new Intune extensions (such as email profiles), managing your MDM settings, configuring VPN and wireless profiles, and deploying certificates? I will be co-hosting these sessions together with my friend and ECM expert Kenny Buntinx. Both are currently scheduled on Wednesday September 17h. You can browse the full session catalog here. Note that Kenny and myself will not be the only Belgians presenting at the conference. Also in the Windows track there will be 2 sessions from our fellow SCUG member Dieter Wijckmans and a session from Michael Van Horenbeeck. Together we will show some serious Belgian Community Power! Interested? Registrations for the event are still open. Click here for details.